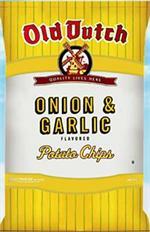 Old Dutch Onion & Garlic Potato Chips have a zesty combination of flavors that perfectly complement your chip for that robust taste you love. They're crispy, satisfying, and simply delicious. Ingredients: Potatoes, Sunflower Oil and/or Canola Oil, Corn Maltodextrin, Salt, Dextrose, Dehydrated Onion, Dehydrated Garlic, Natural Flavors (contains Torula Yeast), Parsley, Hydrolyzed Corn Protein, Citirc Acid, Caramel Color, and less than 2% Silicon Dioxide (as anti-caking agent). 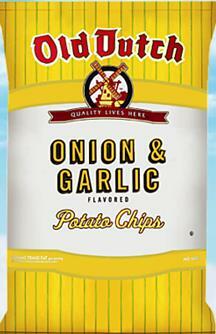 These are my favorite chips of all time! I moved away from Minnesota 5 years ago and still get these chips every time I visit. I am so glad I can order them online now. The only problem is that you have to make sure you aren't going to be kissing anyone, because your breath will stink!! But it is 100% worth it for the flavor of these chips!